Researching a live streaming platform comparison can be overwhelming, as there are many factors to keep in mind to find the best solution for you or your organization. You want a live streaming service that can grow and scale with your needs, has all the features you want, and won’t break your budget. Important features for live streaming like privacy, distribution, and end-user features help define the content you stream and the audience that watches your live events. Businesses looking to brand their content, for instance, will need the ability to white-label web players and remove a platform’s logo from their page. For smaller organizations and businesses, users tend to bump up against platform ads on their page. Fortunately, a few of the below platforms offer an ad-free player, and ad-free user experience, at any level of subscription. Depending on your viewership and the frequency of your events, a bandwidth cap can be a tremendous hindrance; paying more money for a popular event can take a bite out of your streaming budget and revenue. Not every platform will charge users for high viewership or streaming time. Livestream, for example, offers unlimited streaming bandwidth for all users, and never caps the number of viewers who can watch your broadcast in real time. Looking for help getting started, or ongoing support during your live events? Many live streaming platforms offer support in some form or another, whether it’s a live chat, community forums, or one-on-one onboarding. More often than not, customer support is a paid feature. How much you’ll have to pay, of course, depends on the platform and its pricing structure. The ability to customize how your content is delivered and how it can help to grow your business or organization is paramount for so many producers. Most of the platforms detailed here have their own proprietary web-player, but what if you want to integrate that player into a custom app? For that, you’ll need a public API: programmatic access to the live streaming platform that allows your developer to customize the experience as you see fit. Livestream Enterprise customers have access to a public API that offers backend code for seamless app-integration, including an HTML5 player that is optimized for mobile traffic. Live events are an excellent way to increase the visibility of your brand, and they can also be a tremendous source of revenue. Sports teams, educational institutions, online instructors, and business-to-business communities are just a few examples of the organizations using Livestream’s pay-per-view and subscription add-ons. Enterprise users have access to Vimeo’s OTT Live platform, which makes it easy to grow revenue with subscriptions, PPV, and lead capture. Want to keep your event free and accessible, but still bring in revenue? Livestream has a donations feature that can be configured on an event-by-event basis, so you can choose the “ticket price” of each stream individually. Livestream’s Watch page is a destination in and of itself, averaging over 300K unique views per month. Many users find an uptick in traffic from their presence on the watch page, but Livestream also has an “audience booster” add-on that guarantees unique views on your event at a price that fits your organization’s budget. Livestream pricing is available on a month-to-month or annual basis, and all levels offer video-on-demand archiving. A Livestream Premium plan costs $75/month with a one-year commitment, or $199 month-to-month. This plan unlocks our live player embed and the power to stream to platforms like Facebook Live and YouTube Live, as well as robust analytics, email support, and access to our Studio software. Livestream also offers a custom Enterprise solution that includes advanced privacy features like white-labeling and password protection, plus monetization options like pay-per-view and OTT. Enterprise plans include 7-day U.S.-based customer support, available by phone or email seven days a week, 365 days a year. Streamshark.io provides a streaming infrastructure for customers with existing encoding hardware and software, with a three-tiered pricing system dependent on frequency and data usage. The “Lite” plan includes support for three simultaneous streams, viewer analytics, and a customizable player for $50 per month, but this fee does not include the $.12/GB data overages when users exceed their $50 in “credits” provided by the subscription fee. Upgrading to a “Pro” plan doubles the monthly credit allotment, drops the price-per-GB to $.10, doubles the allowance of simultaneous streams, and provides customers with privacy control and Google analytics integration. For business-class customers, a $250/month “Biz” plan provides the aforementioned features, decreases the bandwidth cost to $.09/GB, supports up to 15 simultaneous streams, and includes support and account management. If your workflow is heavily-based on media management and transcoding, the hardware-agnostic platform Wowza is based on a handful of classic features – an HTML5 player, mobile integration, embedding ability – but producers will need their own pre-existing streaming infrastructure for live event broadcasts. An entry-level, pay-as-you go plan at $95 per “instance” works for one-off events, but producers looking to broadcast frequent or regularly scheduled events would do better to invest in the $65/month plan. An unlimited option, targeted toward the consistent event producer, is available for a one-time fee $1995, and includes a year of maintenance and support. Ustream, purchased by IBM in early 2016, offers entry-level subscriptions starting at around $99/month, nearly twice the cost of competing platforms. For a “Pro Plan” subscription, expect to pay anywhere from $99 to $999 a month, depending on how frequently you use the platform. Unlike unlimited streaming platforms, Ustream’s subscription model is based on streaming and viewer hours. If your event runs longer than expected or is more popular than you anticipated, there will likely be an additional fee. For larger organizations holding town hall meetings or looking to promote a new product announcement, these overages can be an unwelcome – and costly – surprise. Like many solutions, multi-quality streaming, social media integration, and Apple TV/Roku are supported. However, reaching the support department company recently purchased by a multinational corporation can be a little tricky. A premium DaCast subscription, starting at $360/month, includes many of the same popular features: an ad-free player, customer support, and multi-bitrate streaming. Producers have the option of a monthly subscription, or per event pricing, which is great for one-off broadcasts. That said, data usage charges and overage fees can be a hindrance for customers looking to stream content on a regular basis. Houses of Worship are fast becoming one of the largest subscriber groups for live streaming platforms. To meet this increasing demand, niche providers have begun to offer specific plans targeted at house of worship clients. Two companies, StreamingChurch and ChurchStreaming.tv, have a similar market, but wildly varying features. While both services offer ad-free platforms, only ChurchStreaming.tv provides customer support and does not charge bandwidth overages. Gamer favorite Twitch.tv, a subsidiary of Amazon.com, has dominated the world of live video game streaming since its launch in 2011. Free users have access to Twitch’s screen-sharing software, but an ad-free experience and chat customization will require an upgrade to Twitch Turbo. Since Twitch is hardware-agnostic, using external capture devices and cameras is supported, but be prepared to troubleshoot your own workflow. Even global media companies like Facebook and YouTube have thrown their hats into the live video ring, with recently released initiatives Facebook Live and YouTube Live. Both platforms count ease-of-use as a major draw, but neither company offers onboarding or customer support. While YouTube’s Creator Studio will relay your live broadcast directly to a YouTube page, the free service almost certainly guarantees that viewers will have to watch pre-roll ads before your content. Enterprise-level customers can enjoy an ad-free experience, but the six-figure annual price tag is a little steep for some companies. YouTube Live users can embed their live player, but only after activating “adsense,” which lets YouTube run pre-and-mid-roll ads during your live broadcast. Facebook Live, which streams directly to your Facebook page, is free of charge. But with future ad-rolls and branding on the player, Facebook Live for Livestream is a great ad-free alternative. Facebook Live for Livestream lets producers stream indefinitely to both platforms at the same time. Users can stream to Facebook Live with their mobile devices using the app, but if you are looking for higher production value consider the Mevo camera, which allows users to cut between multiple shots and stream to their page in 720p. Live streaming Platform Comparison: Why Choose Livestream? Livestream is the only live video end-to-end solution. The Livestream platform offers unlimited streaming service, no ads, top-notch customer support, syndication, API, as well as easily paired products (like the Mevo or Studio 4K switcher) and professional Production Services. We believe Livestream is the best platform for organizations of any size to manage their live video, but you need to decide for yourself. 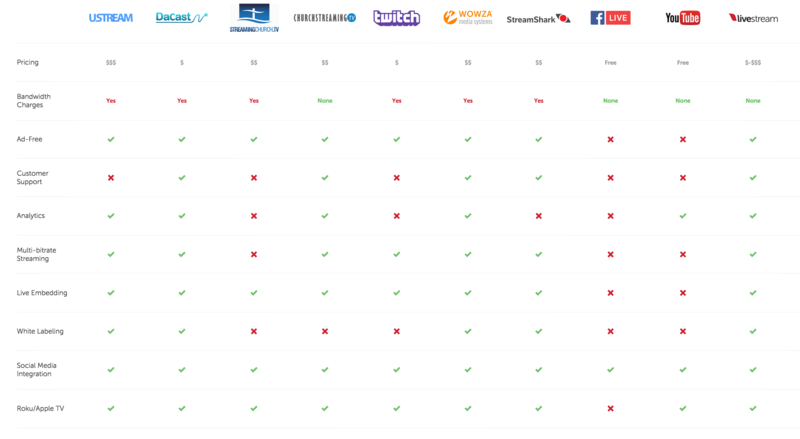 Based on what we’ve heard from customers who’ve switched to our platform, we created this live streaming platform comparison guide with descriptions of the features from each brand including pricing info, viewer experience, and ease of set-up. Livestream counts Spotify, The Philadelphia Eagles, Carolina Herrera, and many other major enterprise brands among its 10,000 active customers, but you don’t need to be a Fortune 500 company to harness the power of this versatile platform. Livestream also works with Houses of Worship, educational organizations, local governments, startups, cultural organizations, and meetups. Streaming to Livestream is simple: users can stream directly to their accounts with Producer software, our Studio software and hardware solution, the Mevo live event camera from Livestream, or a special plugin via the Newtek Tricaster. Businesses and organizations at every level are directing more attention and resources to live streaming, and consumers have been responding in kind. 2016 has brought a dramatic increase in live streaming viewership across smart TV, desktop, and mobile devices. Whether your team is new to live video streaming, or looking to improve their existing outreach with more live events, with the right network and plenty of bandwidth, you’ll reach your biggest audience yet in no time!